The notification for the election was issued on March 5 and last date of filing nominations is December 12. The scrutiny of nomination papers would take place on March 13 and the last date of withdrawal is March 15. The elections, if necessary, would be held on March 23. Union minister JP Nadda on Thursday filed his nomination for election to the lone Rajya Sabha seat in Himachal Pradesh. The seat is falling vacant on April 2 following the expiry of Nadda's first term. Nadda submitted his papers to the returning officer. He was accompanied by Chief Minister Jai Ram Thakur, BJP state chief Satpal Singh Sati, Speaker Rajiv Bindal and other cabinet ministers. He would possibly be elected unanimously from the state as the Congress, which has only 21 members in 68 member House, was unlikely to contest the seat. However, Congress sources said that a final decision in this regard would be taken soon. Speaking to media persons later, Nadda thanked the central and state election committees of the party and said he was asked by BJP chief Amit Shah and Prime Minister Narendra Modi to file the nomination. Referring to the assistance Himachal Pradesh received from the Centre, he said that an AIIMS was coming up in Bilaspur, a government medical colleges had been opened at Nahan, Mandi and Chamba. He said he had met the chairman of the Finance Commission recently, requesting liberal assistance to the state. 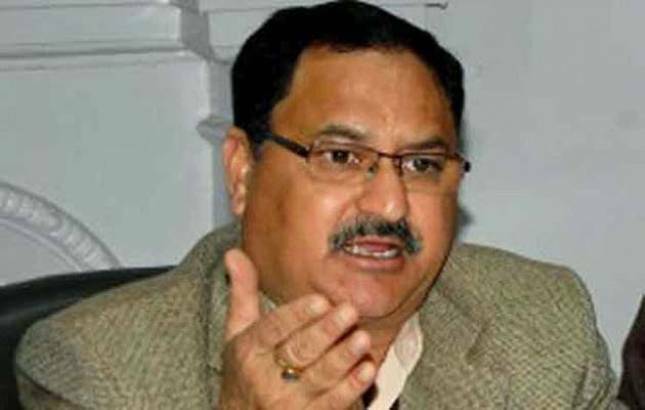 Nadda said the commission would visit the state soon. He said during a meeting of chief ministers at Delhi he met the HRD Minister Prakash Javadekar who assured him that a decision would be taken soon on the main campus of the central university.